Storm’s parents, it turns out, weren’t oddballs. They were pioneers. More and more progressive parents have decided to liberate their children from the chains of gender. They give their children gender-neutral names such as Zoomer or Scout. 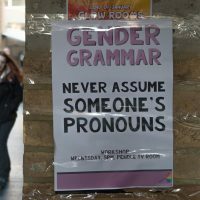 They refer to them using gender-neutral pronouns. They buy them gender-neutral toys and scrupulously avoid pink and blue. They tell people that it’s up to the child theirself to decide what gender they identify with. These parents don’t like the term gender-neutral, explains New York magazine. They prefer gender-open, gender-creative or gender-affirming. For them, the gender binary is a trap constructed by society to imprison their children and restrict their human potential. Gender is a spectrum, not a binary, they argue. They hope that freeing our children from the shackles of arbitrarily imposed gender norms will be the first steps in a sweeping cultural change to create a better, fairer, more egalitarian society.